Home Value Money PowerPoint Templates And PowerPoint Themes 1012-The above template displays a diagram of many dollar banknotes and a house. This image represents the concept of home value, real estate. It signifies capital, construction, currency, dollar, economy, finance,investment, planning, property, savings, success. It is a useful captivating tool conceived to enable you to define your message in your Business and Financial PPT presentations. The structure of our templates allows you to effectively highlight the key issues concerning the growth of your business.-Home Value Money PowerPoint Templates And PowerPoint Themes 1012-This PowerPoint template can be used for presentations relating to-"Home and money, architecture, finance, business, success, money" Record growth with our Home Value Money PowerPoint Templates And PowerPoint Themes 1012. Download without worries with our money back guaranteee. 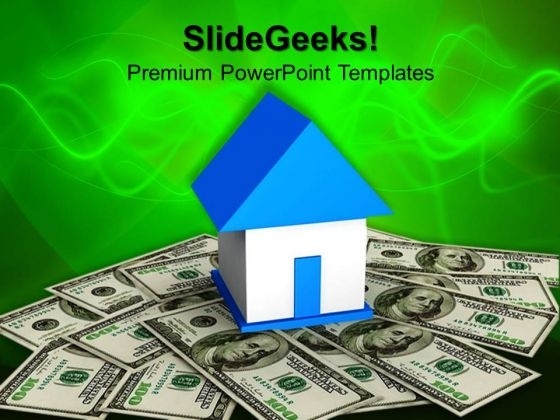 Accelerate success with our Home Value Money PowerPoint Templates And PowerPoint Themes 1012. Download without worries with our money back guaranteee.